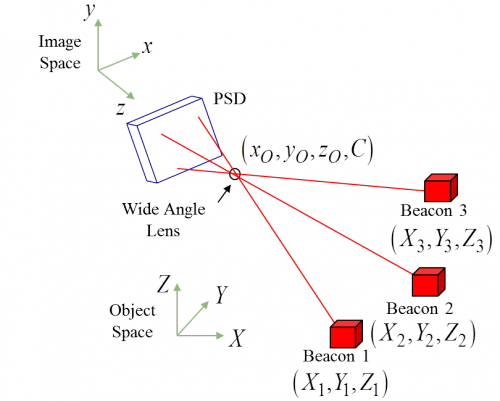 Research is being performed for vision-based attitude and position determination for formation flying applications using a newly-developed sensor by Dr. John L. Junkins employing Position Sensing Diodes to determine line-of-sight vectors to optical beacons. The vision-based navigation (VISNAV) system comprises of an optical sensor of a new kind combined with specific light sources (beacons) in order to achieve a selective or "intelligent" vision. The sensor is made up of a Position Sensing Diode (PSD) placed in the focal plane of a wide angle lens. When the rectangular silicon area of the PSD is illuminated by energy from a beacon focused by the lens, it generates electrical currents in four directions that can be processed with appropriate electronic equipment. While the individual currents depend on the intensity of the light, their imbalances are weakly dependent on the intensity and are almost linearly proportional to the location of the centroid of the light beam in the PSD. Spacecraft formation flying is an evolving technology with many possible applications, such as long baseline interferometry, stereographic imaging, synthetic apertures, and distinguishing spatial from temporal magnetospheric variations. A significant advantage of distributed spacecraft platforms over a single multifunctional spacecraft is that single point failures can be rectified through replacement of cheaper and smaller spacecraft to maintain mission capability, thus providing a more reliable and robust system. Many missions (in particular interferometry missions) rely on precise relative position and attitude knowledge in order to maintain mission requirements. To date, most research studies into determining relative positions and attitudes between vehicles have involved using the Global Positioning System (GPS), which restricts the spacecraft formation to near-Earth applications. 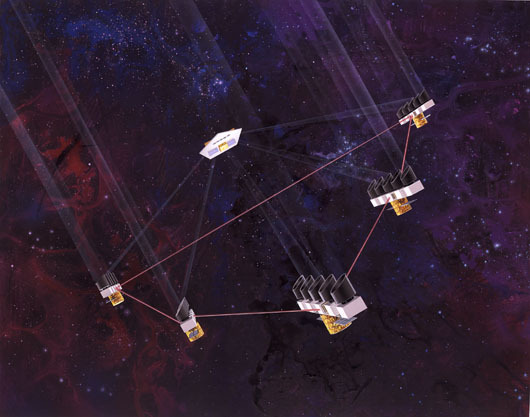 An application of GPS-like technology to a deep space mission has been proposed, but this requires extensive hardware development and is subject to the generic GPS performance-limiting effects, including multipath, geometric dilution of precision, integer ambiguity resolution, and cycle slip. The main objective of the proposed research is to provide a novel, reliable, and autonomous relative navigation and attitude determination system, employing relatively simple electronic circuits with modest digital signal processing (DSP) requirements, and being fully independent of any external systems. Alonso, R., Du, J.-Y., Hughes, D., Junkins, J.L., and Crassidis, J.L., “Relative Navigation for Formation Flying of Spacecraft,” Proceedings of the Flight Mechanics Symposium, NASA-Goddard Space Flight Center, Greenbelt, MD, June 2001, pp. 115-129.